The wedding’s in the bag, so brother and bride are soon-to-be off on their honeymoon. They did something quite common for couples these days, and made the trip the feature on their list, in a honeymoon registry. So as a gift-giving guest you logged into their site to select from a host of honeymoon experiences. There were bigger bits (plush hotels, champagne dinners), interesting ones (spa days, boat trips, cultural tours) and mini presents to pick too (coffees, cocktails, ice creams, picnics). So clever and such a wonderful way to ‘send off’ the couple (rather than with a crock pot, however useful that may be). These two are traveling through Italy for some time, taking in Rome, Naples, Sardinia and more. The route reminds me of the Italian leg of a Grand Tour, the traditional European trip taken by upper-class young men of means (Brits, Europeans, later the Americans) in the 1700s and 1800s. Lasting from some months to some years, the Tour was a sort of rite of passage, an educational eye-opener that exposed travelers to art, culture and the roots of Western civilization. France and Italy were must-stops on a standard itinerary. 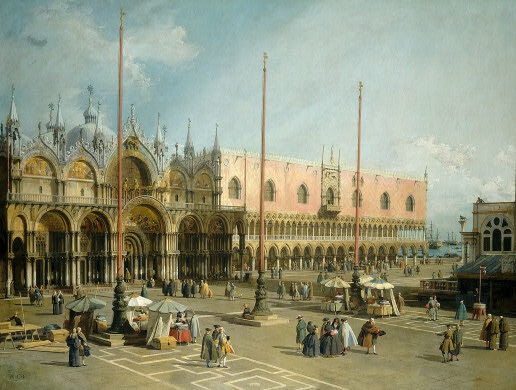 Since the newlyweds are kicking off with a pleasurable stay in Venice (the jewel in the crown of any self-respecting Tour – as was a ‘cautious residence’ in Rome), we’re taking in Giovanni Antonio Canal, or Canaletto (1697 – 1768) today. He’s a favorite of my brother’s and is known above all for his superlative views of Venice. Taught by his father (a theatrical scene-painter), Canaletto spent the first years of his career creating opera sets. By the 1720s he’d turned to topographical views and, since his native city Venice could be compared to a stage set of sorts, he set about capturing on canvases her drama and spectacle. From the get-go, his chief clients were English aristocrats, on their afore-mentioned Tours. In fact the buyer of our two paintings, Entrance to the Grand Canal from the Molo (1742 – 1744) and its pendant, the Square of Saint Mark’s (1742 – 1744) was the Earl of Carlisle, who hung them in his Castle Howard. Both works tell how Canaletto geared his art to beguiling British buyers. He focussed on the top tourist sites and, since accuracy and detail were hot selling points, he made these the basis of his style. In the St Mark’s scene he painstakingly paints in the frilled tracery across the architecture of the Doge’s Palace, to the right. See the super-fine flow of arches in the portals of the basilica. In the Molo image, groups of people idle along a landing dock: it’s the morning and a fishmonger displays his catch to two wigged gents. Gondolas bob and across the lagoon soar the domed Redentore church (Palladio, 16th-century) and the double-domed Santa Maria Salute (Longhena, 17th century). These sorts of paintings were essentially exquisite, detail-rich souvenirs of someone’s stay in the city. Canaletto’s tiny transcriptions of the sites before him may have been aided by a camera obscura (a darkened box which allowed an image of a brightly lit subject or scene to be projected onto a screen). In any case, he also sketched endlessly, to ensure his eye and hand stayed fresh. And boy, did it work. 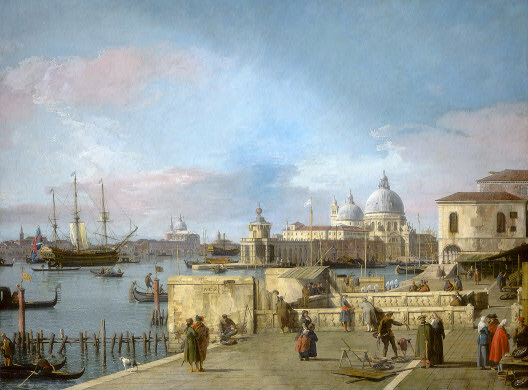 Here’s what one fellow Grand Tour operator, the engraver and antiquary George Vertue had to say about him in 1746: “the Famous Painter of Views, Canaletto of Venice, has procured a great reputation and his merit and excellence in that way… is much esteemed.” Buon viaggio! I love this painting! Thank you! I particularly love his use of light – one can practically see Venice’s humidity and stickiness dripping off his work. Is using a Camera Obscura cheating – early painting by numbers?